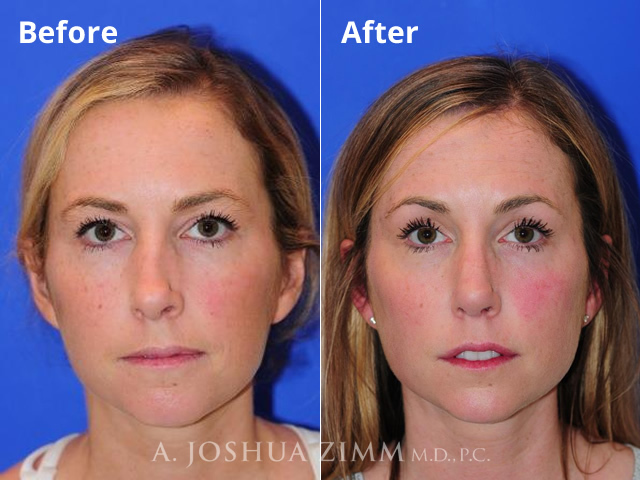 To significantly repair and improve the appearance of an over- or under-operated nose and re-establish a natural, harmonizing, well-proportioned look to it and the face as a whole. To improve nasal function, especially breathing, as required. Revision surgery is different from primary rhinoplasty and requires unique expertise to understand the underlying anatomic causes and complications of the various problems in an over- or under-operated nose. Targeted approaches are successful if the problem is focused and limited. More comprehensive reconstruction is needed for severe problems. To maximize the benefits of this corrective cosmetic procedure it is important to find a surgeon who specializes in revision rhinoplasty and with whom a patient can clearly communicate their goals for improvement. It is important patients truly understand the limitations of revision surgery and have realistic expectations. This procedure can restore a more natural look to a nose that has been over-operated and appears too small, short, long, narrow, wide or twisted. It can further refine a nose that did not have a full correction with the previous procedure. Impaired nasal breathing caused by previous surgeries can be substantially improved. In the hands of the right specialist, revision rhinoplasty gives patients a renewed sense of self-confidence and the real hope of having a natural looking nose that enhances their facial features. Sometimes a nose may be virtually beyond repair, but this is rare. The biggest obstacle facing a revision rhinoplasty specialist is trying to fix a nose that may have undergone several revisions or in which there is limited tissue to work with. The amount of scarring or degree of skin contracture may limit the degree of improvement possible. As disappointing as it may be, in some cases it may be best to avoid surgery, as the risks of further revision may outweigh the benefits. For a patient who knows there's something wrong with their nose, but just isn't sure what they want, revision rhinoplasty can be a frustrating process. That is why it is essential to work with a specialist who can help patients sort through their confusion and fear and find a solution. The number of revision surgeries a patient has previously undergone. The presence of scar tissue from prior surgeries, which may cause complications. An outpatient procedure that results in little pain or nausea, the recovery period for revision rhinoplasty is approximately 2 weeks. Patients will wear a small nasal cast for 1 week and there is usually some swelling and bruising. This is dramatically reduced by the end of the first week of recovery. After bandage (or splint) removal, patients can usually go outside with makeup.